This 18th century Bucks County plastered fieldstone house with its broad porches and wainscoted entry hall offers the essence of peaceful hospitality for visitors to Olde Bucks. 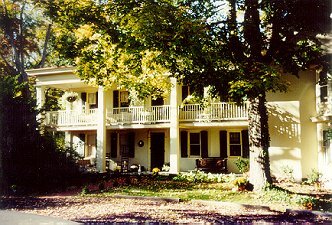 Located 8 miles north of New Hope on the River Road, the bed and breakfast inn features 6 spacious guest rooms with private baths, queen size beds, air-conditioning, and some with fireplaces. Breakfast is served in the comfortable dining room or guests may have it brought to their room or to one of the porches. Afternoon refreshments are available in the colonial common room with its beamed ceiling and walk-in fireplace. Peaceful, romantic setting just minutes from fine restaurants and the antique, craft shops and galleries for which Bucks County is renowned. Nearby activities also include canoeing, tubing, fishing, hiking biking, shopping and cultural attractions in Doylestown. Rates: $125 - $155 per night, double occupancy, weekends and holidays. Mid-week $15 less. Senior discounts. Major credit cards accepted. Smoking free. Auto Club - 3 Diamond and Mobil-3 Star. Brochure available. Please call for particulars. This and other New Hope Bed and Breakfast Inns can be found here in The Register.